For current research, please see the website for the Autonomous Mobile Robotics Laboratory at UMass Amherst. This page lists my research as a PhD student and earlier, for archival purposes. My PhD thesis at Carnegie Mellon University was on robust and accurate long-term mobile robot localization in varying environments. We had multiple CoBots deployed in our buildings, which covered 1000 km over deployments to demonstrate the reliability and robustness of the localization algorithms introduced in the thesis, in particular Episodic non-Markov Localization. The CoBots serve as indoor service mobile robots on multiple floors of the different buildings occupied by the School of Computer Science at Carnegie Mellon University. The CoBots can be reserved by the building occupants to perform tasks like delivering packages, collecting and delivering mail to and from multiple offices, escorting visitors, delivering spoken messages, and serving as semi-autonomous telepresence robots. We are interested in having continuously deployed robots in the human environment, and my research is focused on having the robots be robust to the presence of unmapped movable and moving objects, as well as the inevitable changes in such a large deployment environment. Over the course of regular deployments of the CoBots, we have been logging sensor data, as well as the reported location of the CoBots (as computed by the on-board localization algorithms) and the locations where the localization was reset. The sensor data logged include the observed robot odometry and the laser rangefinder observations. Please cite our paper (listed below) if you use this data in your research. The logs are saved in the ROS bag format. Laser messages are in the standard sensor_msgs/LaserScan format, odometry in the standard nav_msgs/Odometry format, and localization initialization and location estimates in the custom cobot_msgs/LocalizationMsg format. The bag files, and the maps used for localization are available for download from here. Fast Sampling Plane Filtering (FSPF) is a RANSAC based algorithm for extracting 3D points corresponding to planar features, given a depth image. The plane filtered points may be used for localization, or to build polygon maps of environments. A workshop paper on the topic was presented in the RGB-D 2011 Workshop [pdf]. A complete paper (“Planar Polygon Extraction and Merging from Depth Images”) was presented at IROS 2012 [pdf]. The video demonstrates real-time plane filtering, polygonalization and polygon merging for a scene observed using the Kinect sensor. The source code is available on the mercurial repository [here]. CoBot uses depth camera sensors for localization and for safe navigation. The depth camera localization algorithm uses plane filtered points generated by FSPF with CGR to localize a robot on a vector map. It runs in real time on the CoBots at full frame rates and at full resolution (640x480 @30fps) while consuming <20% CPU on a single core of the Intel Core i5 540M (2.53GHz) processor. The mean localization error of the robot over experiment trials (of length >4km) while using the Kinect for localization is <20cm and <0.5°. This work was presented at ICRA 2012 in the paper titled “Depth Camera Based Indoor Mobile Robot Localization and Navigation” [pdf]. The video demonstrates real-time localization using the Kinect sensor on CoBot2. Source code is available [here]. During the summer of 2010, I interned at Intel Research Pittsburgh. Working with Brian Coltin, we developed a semi-autonomous telepresence role and a visitor tour guide role for CoBot 2. We succesfully demonstrated CoBot 2 during the 2010 Intel Research Pittsburgh Open house, and over course of the day, escorted visitors around the labs, introducing them to the various research projects on display. CoBot 2 autonomously navigated through dense crowds while interacting with the visitors. The video below shows CoBot 2 in action during the open house. I led the CMDragons RoboCup SSL team at CMU for several years, and won the 2015 RoboCup, and came second in 2010, 2013, and 2014. I worked on several parts of the robot soccer problem, including time-optimal interception, motion control, attack and passing strategy, and the threat-based defense. Our “Coerce and Attack Planner”, developed in 2013, was instrumental in succesful freekick execution, and is detailed in the AAMAS 2014 paper titled “Opponent-Driven Planning and Execution for Pass, Attack, and Defense in a Multi-Robot Soccer Team” [pdf]. We developed a WiFi based localization system which localized cobot on a graph based map including WiFi data (Means and Standard Deviations) at every vertex of the graph. CoBot 1 succesfully localized and navigated autonomously along this graph based map. 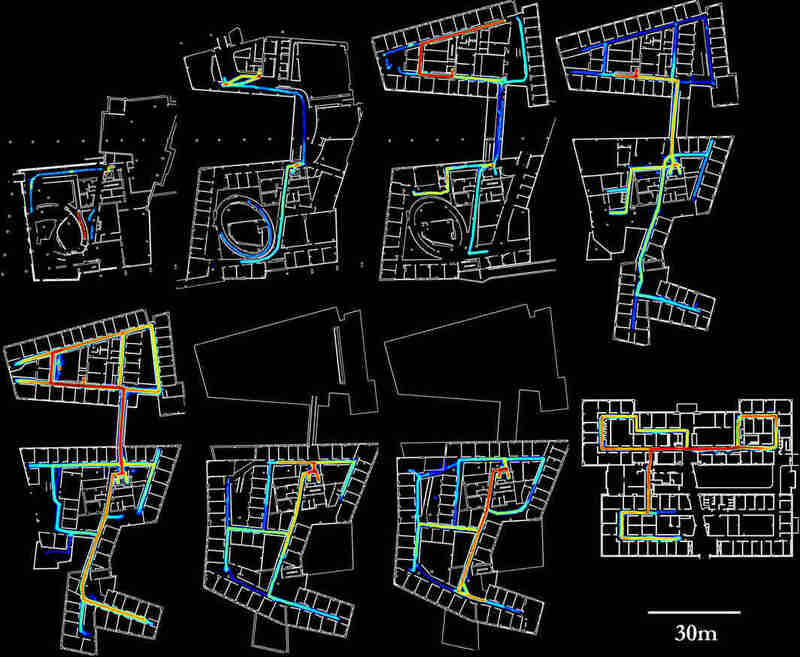 For a detailed description of the WiFi based localization algorithm, please refer to the paper “Wifi localization and navigation for autonomous indoor mobile robots”, Joydeep Biswas and Manuela Veloso, ICRA 2010, available [here]. My undergraduate B.Tech project was on the design, construction and control of Reactobot, a reaction wheel stabilized single wheel robot. Reactobot consists of a sealed transparent single wheel shell, which encloses all the electronics and mechanical parts. The robot is balanced on the wheel edge by controlling a reaction wheel suspended from the axle of the wheel. Forward / reverse drive is achieved by displacing the suspended mass forward or back, controlled by actuating the wheel axle. The robot is capable of balancing on its wheel edge while standing in place. Turns are executed by yawing the wheel while driving the robot forward. The video below demonstrates the capabilities of Reactobot.